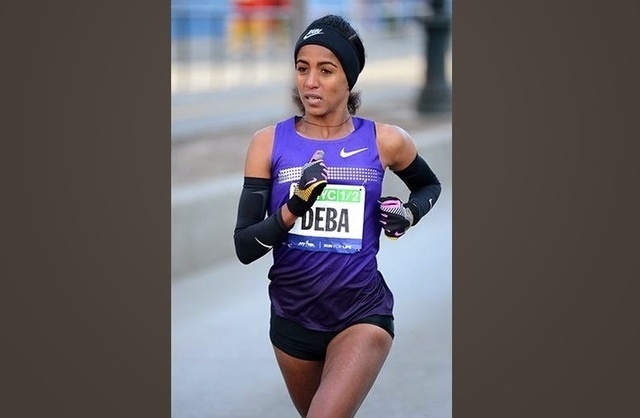 New York (TADIAS) — After placing second at the New York City marathon in November, when Buzunesh Deba of Ethiopia was preparing for next Monday’s 2014 Boston marathon, she came down with a respiratory infection that cost her several weeks of training starting late January. She expected that interruption to affect her race at the New York City half marathon, which took place on March 16, in temperatures below the freezing point. Nevertheless, in a field that included reigning Olympic 10,000m silver medalist Sally Kipyego, 2013 Frankfurt and 2011 Boston marathon champion Caroline Kilel of Kenya and others, the New York City resident Buzunesh managed to finish second behind Kipyego in 1 hour, 8 minutes and 59 seconds. Her 2014 half marathon finish and its nearly 1-minute improvement on her personal best (PB) was all the more meaningful because of her interrupted training in the lead-up to the race. “In fact, when I went into the race, I was thinking I may even be forced to drop out because I’d been sick and might not have enough energy,” she said. The stacked line-up for Monday’s women’s race includes Ethiopians Mare Dibaba, who ran 2:19:52 in Dubai in 2012 and won in Xiamen, China in 2:21:36 this January, and former world 10,000m silver medalist Meselech Melkamu, who won Frankfurt in 2012 in a course record 2:21:01. The field also includes a bevy of fast Kenyans like the defending Boston champion and favorite Rita Jeptoo, who won October’s Chicago marathon in 2:19:57, current Chicago and former Boston runner-up Jemima Sumgong (PB 2:20:48), Eunice Kirwa (PB 2:21:41), and former Boston champions Sharon Cherop (PB 2:22:28) and Kilel (PB 2:22:34). It was running with no fear that took Buzunesh to eight marathon wins in the United States including course record wins in the 2011 San Diego and Los Angeles marathons (defeating Mare Dibaba in the latter). It was running with no fear that took Buzunesh twice to the podium in the prestigious New York City marathon, where in 2011, she finished behind compatriot Firehiwot Dado but ahead of runners like the former world half marathon champion Mary Keitany of Kenya, who had won London in 2:19:19 just seven months prior; and Kilel, who had a PB nearly a minute faster than Buzunesh going in to the race. “She puts her hard work on display,” said Worku. In the 2013 New York marathon, Buzunesh ran from the front along with her training partner Tigist Tufa, maintaining the pace she had trained for, and disregarding the field behind her, building up a lead of nearly three minutes at one point. She was only caught in the final miles of the race by then-London champion Priscah Jeptoo of Kenya, who won ahead of Buzunesh’s 2:25:56 second place. The women left in Buzunesh’s wake included the world champion Edna Kiplagat of Kenya, who had run 2:19:50 for second place in London a year earlier. Both the New York and Boston races are among the major marathons of the world, assembling top fields. Buzunesh was entered in the Boston marathon in 2012, but didn’t run it due to an injury. Last year, she had run the Houston marathon in January, placing second there in 2:24:26, and she was in New Mexico during the running of the 2013 Boston marathon on April 15, when bombs went off near the finish line several hours into the race. With masses of non-professional runners on the course and spectators lining it, the explosions left three dead and many seriously injured. Race organizers and Boston law enforcement officials have outlined tightened security procedures and an increased police presence leading up to and on race day this year. “I don’t think there’ll be anything to be concerned about or anything to fear for us elite athletes or the mass runners,” added Buzunesh. Ethiopia’s Lelisa Desisa won the men’s race last year, and gave his medal to the City of Boston afterwards as a gesture of empathy for what the city and its residents experienced. Lelisa is back this year, and favored to win again, after a spectacular year. He added a world championship marathon silver medal in Moscow last August to his April Boston win, which itself came after a victory in Dubai that January. He won a fast Ras Al Khaimah (UAE) half marathon this February. Kenya’s reigning Chicago champion Dennis Kimetto is regarded as Lelisa’s toughest opponent, and his compatriot, the former 10K world record-holder Micah Kogo, will also be looking to upgrade his 2013 Boston second-place finish. The strong 2014 field includes Ethiopians Gebre Gebremariam, the former world cross country and 2010 New York marathon champion, who was third in Boston in 2011 and 2013; former Los Angeles marathon champion and 2014 Dubai runner-up Markos Geneti; and 2013 Rotterdam champion and 2012 Chicago third-placer Tilahun Regassa. American Ryan Hall, who was third in Boston in 2009 and has since finished just off the podium twice, is also coming to the race from Ethiopia, having spent time training there. Others coming from Addis Ababa include the nation’s 2013 world championships 10,000m bronze medalist Belaynesh Oljira, who was 5th in the Dubai marathon last year, and the 2012 and 2013 Tokyo marathon runner-up Yeshi Esayias in the women’s race. The Boston marathon takes place on the Patriots’ Day holiday celebrated in Massachusetts on Monday, April 21, with the elite women’s race kicking things off at 9:32am Eastern time, while the men’s race starts shortly thereafter. The race will be televised live throughout the U.S. on the Universal Sports channel.